Are You Setting Your Child Up for a Dog Bite Injury this Summer? Dogs bite for purposeful reasons. When we think only bad dogs bite we set ourselves (especially our kids) up for injuries. "Many parents unwittingly set their children up for dog bite injuries believing that only bad dogs bite. Dogs bite due to situation and context and often times because we don't realize we can practice prevention,” advises Melissa Berryman, author of the safety and liability protection book, People Training for Good Dogs: What Breeder Don't Tell You and Trainers Don't Teach, http://www.ptfgd.com. The Centers for Disease Control and Prevention (CDC) in Atlanta, reports that 3.5 million children are bitten by dogs each year. Of those, children under 15 make up 70 percent of dog bite victims. By age 12, the CDC forecasts that half of all children in the US will have been bitten by a dog. Act Friendly: Smart dogs know strangers can hurt them so act like a friend. Teach children to relax, use a high pitch voice and tap the side of their leg to signify they are a friend and not foe or prey. You have been primed to expect certain breeds to bite and ignore situation and context. Remember dogs are responding to how your child is acting now. Act happy to see the dog even if you must pretend. *ASK the Dog: Teach your child to ASK a dog if it wishes to be patted by a stranger by tapping the side of their leg, and speaking in a higher pitched voice. A stiff fist or hand offered towards a dog is offensive and offers negative information about your child. Tapping allows a dog to state decisively if it wishes to be bothered or wants to be left alone. Don’t just ask the owner, ASK the Dog! *Avoid Hugging: Dogs do not hug to show affection. It does not mean I love you, I support you or I am comforting you. It is a negative dominating gesture. Encouraging kids to hug a dog sets your child up to be bitten in the face. If a dog does not bite it may be lower ranking or deferring to you. Dogs often stiffen as a sign to say they don't like something and resort to biting because we miss their signals. Know Your Child's Place: Dogs interact with people and animals they know depending on rank. If a person is above the dog in status, the dog does not have enough power to react. If a dog is above your child in status and your child steps out of line, it is normal for them to correct your child with a growl, nip or bite due to insubordination. When children get together, the child's dog may treat the visiting child differently. *Pay Attention: Dogs are wired to capitalize on opportunity. A majority of dog bites occur with children because adults were not paying attention, got distracted, left a child alone with the dog or the adult left the room. 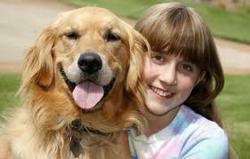 Supervision of those with control over the dog is essential or the dog and child must to be separated. *Avoid Running: Dogs interpret movement as prey whether your child is playing tag, running, biking or skating. Instincts are very powerful. Many dogs cannot control their impulse to chase a fantastic opportunity. Teach your child to avoid running by or playing chase games with dogs. Don't expect a dog to know not to chase your child. A former animal control officer from 1993-1998, Melissa Berryman is the author of People Training for Dogs; What Breeders Don't Tell You and Trainers Don't Teach. The book is packed with safety and prevention information for dog owners and non-owners a like. She is a national dog bite injury consultant who works with dog owners, victims and rescue groups. She holds an undergraduate degree in Animal Science Pre-Veterinary Medicine and a master's in Public Administration-Non-Profit Management.